In recent weeks I have read three new SF novels which offer such warnings. I will begin with the one whose setting is most distant from us in time. Things weren’t going too well for life on Earth, in the Population Crisis – once known as the Climate Change Crisis, but population pressures driven by climate change had long ago become the really obvious issue. By the dawn of the twenty-third century … all the oceans were rated dead or dying, and a frightening global percentage of agricultural land was useless. Almost the entire human population lived packed into the surviving cities, remodeled and densely stacked: the crumbling “megahives.” … Outside them scavengers eked out short lives in the polluted “Dead Zones,” or in raft clusters on the acidified oceans. Fortunately for the reader’s enjoyment, the book centres on a secret research project in a vast cavern beneath the mountains of Poland, not the devastated surface world. There’s a full review on Chicago Review of Books so I won’t say any more except I would have preferred the story at full (novel) length rather than sketchily presented, as it is, at novella length. 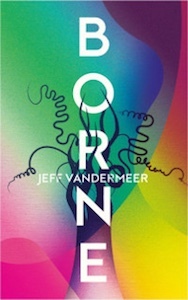 Borne is a far better book than Proof of Concept despite a similarly post-apocalyptic setting – a decaying city, in this case, isolated from the rest of the world. The implied time-frame is undefined but would seem to be 50 – 100 years in our future. Mass refugee movements around the world, driven by sea-level rise, are recent history; “biotech” is so common and so poorly controlled that it is a pollution problem; and the city has been split and ruined by two warring power blocs. The protagonist is one of the minority eking out a feral existence between the two, and precipitates their collapse. Many years ago, I knew Norman Spinrad as a consistently readable SF writer overshadowed by giants such as Asimov, Heinlein, Herbert and Clarke. The People’s Police is better than anything of his that I read at that time, and better than most of what the giants were writing, too. It is set in New Orleans, sometime around the middle of this century. The Big Easy has been transformed by climate change, in particular by sea level rise and a hurricane season which has become so reliably catastrophic that it has earned capital letters. The lowest parts of the city have been abandoned to the swamps, the very highest parts are still attracting tourists except in the Hurricane Season, and the remainder is seasonally flooded: the Swamp Alligators, the lawless underclass living in its stilt-raised shanties, get about in boats or on foot according to the water level. A grim reality? Not in Spinrad’s capable hands. One of the commendations on the back cover calls Spinrad, “that most miraculous of creatures, a utopianist’s dystopianist,” and it’s a good description. His narrator is a venal bordello-keeper, while one of his protagonists is a Swamp Alligator turned cop, and the other is a hippie chick who scraped a living as a busker before the voodoo gods chose to possess her. 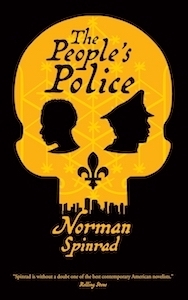 The People’s Police is a blackly satirical laugh-out-loud romp which cheerfully applies a blowtorch to every level of government and big business and puts community at the heart of a reborn city. There’s an excellent full review on Amazing Stories if you want to know more but, really, I encourage you to simply find the book and start reading. Further reading and viewing: Michael Grunwald penned an entertainingly scathing environmental history of Florida when hurricane Irma was threatening to wallop the place last September. Read it here for the factual basis of Spinrad’s novel. To see what the territory looks like, and catch a wonderful movie, track down Beasts of the Southern Wild. Here’s a fourth new sf dystopia: Our Memory Like Dust, by Gavin Chait. It is based firmly on the present reality of African climate refugees’ mass migration into Europe, fast-forwarded 20 or 50 years, and is a very good novel in which conflict between solar farmers in the Sahara, evil fossil fuel producers and an ISIS-like rebel army is crucial. It reminded me of Bacigalupi’s The Water Knife more than of anything else I’ve read recently but is much more positive in its outlook, showing that we can potentially solve the worst of our problems through a combination of engineering and government policy. Too optimistic? Perhaps; but we need optimism. 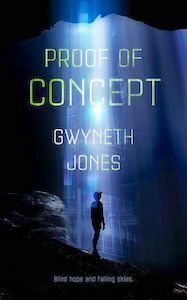 For more about the book, see eco-fiction.com, a site (new to me) which could be a great resource for similar books. William Gibson has done as much as any other SF writer – any other writer in any genre, in fact – to look into the future our present is creating. Here is a good introduction to his work for those who don’t know it. Gavin Schmidt, one of the world’s leading climate scientists, has ventured into fiction with a short story which you can read online at Motherboard. As he says in this introduction, it’s a spin-off from serious work he was doing on the possible longevity of civilisations. Next Next post: Do the finer details of climate science matter any more?